Hallobeanies: The Jelly Beans stay at Camp Kidney so that they can trick or treat for Halloween. Meatman: Lazlo's doll, made out of canned meat, comes to life. Strange Trout from Outer Space: Sampson thinks the new trout campers are aliens from outer space he encountered. Cheese Orbs: The aliens from the last episode invade Acorn Flats in search of cheese. 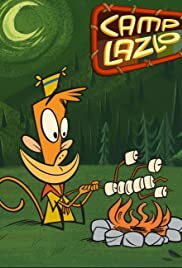 How many episodes of Camp Lazlo! have you seen? Edward the Platypus: [sees Lazlo, Raj and Clam fall from a waterfall] Hooray! Edward the Platypus: [sees them emerge safely] Whatever. Q: What kind of animals are the characters supposed to be? This mayn't be my favourite cartoon or show ever, but it is an outstanding show. Is it quite as good as Rocko's Modern Life? No, but that doesn't stop it from being enjoyable. The animation has a unique style to it, and works really well, and the music is great too. And I loved the clever and funny writing, and the engaging and original stories. Also I found the characters really endearing and funny, Lazlo is certainly very likable, and so are Raj and Clam. My favourite character though is probably Slinkman. On top of that, the voice work is excellent.